I work with CEOs and executives on strategy and innovation. 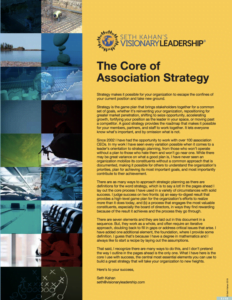 Since 2009 the vast majority of my clients are association leaders: trade associations and professional societies. Over the last 10 years, I have done a lot of work in strategic planning. So, I distilled my process down to a few short steps. You can download my report that lays them all out, The Core of Association Strategy, on the Driving Results page of my website. I have found it useful to chunk down the process and simplify it to make it useful to many others. Of course, there are nuances that must be taken into account for each individual client. Nonetheless, the paper provides a healthy framework and all the self-starters out there will be able to put it to good use! What kind of information could you share with the people who depend on you, that would make their lives easier by simplifying a complex process? If you can provide real value and disseminate it for free to people who can put it to work, you will make a solid contribution to their efforts. Contribution: the gift each of us can give.